When you’re in a relationship, it’s important to let your man know how you feel. It’s great to say those three magic words: “I love you.” But that can start to feel stale after a while. It’s fun to express that emotion in a different way from time to time. So try these ways to say I love you instead. Psst, wondering when to say I love you? Find out here! And to be authentic, search the phrase on a pronunciation website to hear it sounded out. You can search for any language you like. It will be romantic no matter which language you say it in. When you write down not only the words, “I love you,” but also how you feel about your guy, you’re engaging in the time-honored pastime of writing a love letter. Read some famous love letters to inspire you on this way to say I love you (or check out the advice for writing a letter in this post), and then write what’s in your heart. You don’t need to be a writer or a poet. Just a simple note that he can keep will mean a lot and is a great way to show your love. 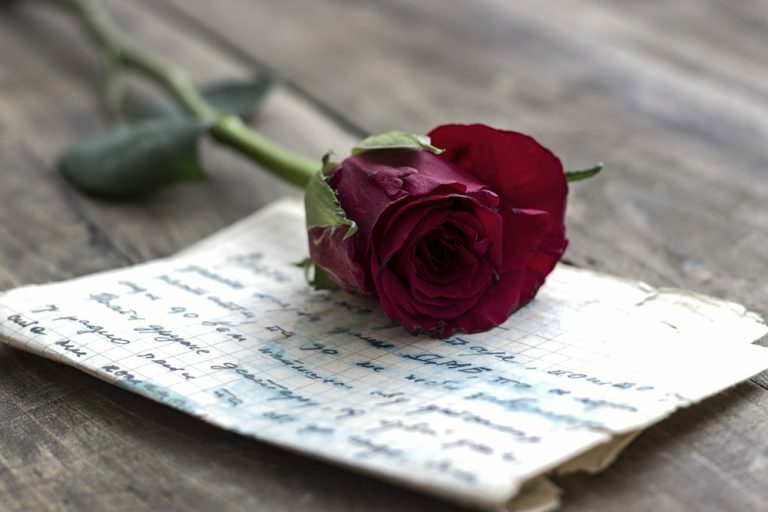 Get even more love letter writing tips in this article. Tell your guy that he completes you, meaning that your life feels complete with him in it. Note that in this way to say I love you that if you come off as being needy, this expression could backfire. It’s important that he realizes that you are not pressuring him in any way. Did you and your man feel an instant connection when you met? And after that initial connection, did you both fall in love? That could indicate you’re soul mates. If that has been your experience, let him know that you consider him your soul mate in this way to say I love you. Let him know that he is someone you can be yourself with, someone who understands you, and someone who brings you true inner peace. You can also use the phrase “head over heels” to describe your love in this way to say I love you. And if you both have a geeky side, you can explain the background of head over heels. When you think about it, your head is always over your heels, so you can then ask him if he knew the phrase dates back to the 14th century and was actually “heels over head,” which meant doing a cartwheel. Don’t be surprised if the loving words lead to making love. More on that here. If you’re a parent, you might be familiar with the phrase, “I love you to the moon and back,” which comes from a children’s book. Parents often say this to their children. But the phrase also means that you love someone more than you can imagine or that you love someone more than anything. So you can say this to your man to let him know the depths of your love in a sweet and cute way. Tell him that you fall in love with him every day. This shows that your love is not getting old and tired and that you cherish each and every day that you’re with him. If you’ve settled into a routine — perhaps you have children — you don’t exactly spend a lot of time over leisurely breakfasts. Well, surprise him one morning (when the kids are having a sleepover at Grandma’s) by cooking him a romantic breakfast in bed. This sets the tone that you can just enjoy each other on a lazy weekend morning. It’s normally the guy who gives flowers to girls, but who’s to say you can’t give flowers to him? Men enjoy gifts too. But stay away from delicate pink buds with a pretty bow around the bouquet, which would seem too feminine. Instead, choose a brightly colored arrangement with yellow or orange flowers. Blue and purple are also nice. Perhaps he’s not a flowers guy. Find out other great gifts for guys. The little things you do sometimes say and mean the most. Notice the things that he could use some help on, and do them for your guy in this way to say I love you. For example, some guys are terrible at buying new socks, so present him with a few new pairs. If he needs to take medication but continually forgets, ask if he remembered to take it. Even throwing a load of clothes in the washing machine that he thinks don’t need washing is a great way to show your love. Besides saying “I love you” or words that are similar, say “I love you” and add the reason. You might love him because of the way he looks after the family. You might love him because he makes you feel special. Whatever it is, tell him. It will make him feel good (compliments usually do – more on that here), and it will mean a lot to him when you choose this way to say I love you. Telling someone you love them is important, so you should do it often. Just make sure your actions back up those words!